The cryptocurrency Bitcoin has attracted widespread interest, in large part due to wild swings in its valuation. This column considers an earlier rise in the Bitcoin price to investigate what is driving the currency’s price spikes. The 2013 rise was caused by fraudulent trades taking place at the largest Bitcoin currency exchange at the time. This finding has implications for policymakers as they weigh what, if anything, to do about regulating cryptocurrencies in light of the record high Bitcoin valuation that many fear is a bubble. 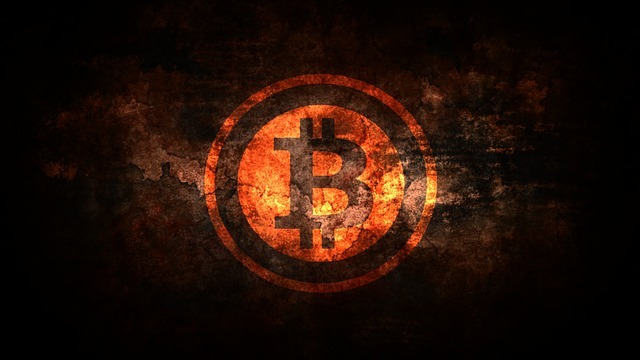 The digital currency Bitcoin was introduced in 2009. Bitcoin and the many other digital currencies are primarily online currencies. The key currencies are those based primarily on cryptography, and Bitcoin is the leading ‘cryptocurrency’. Bitcoin has experienced a meteoric rise in popularity since its introduction. While digital currencies were proposed as early as the 1980s, Bitcoin was the first to catch on. The total value of all Bitcoins in circulation reached $45 billion in June 2017. Its success has inspired scores of competing cryptocurrencies that follow a similar design. Bitcoin and most other cryptocurrencies do not require a central authority to validate and settle transactions. Instead, these currencies use cryptography (and an internal incentive system) to control transactions, manage the supply, and prevent fraud. Payments are validated by a decentralised network. Once confirmed, all transactions are stored digitally and recorded in a public ‘blockchain’,’ which can be thought of as a distributed accounting system. While Bitcoin’s algorithm provides safeguards against ‘counterfeiting’ of the currency, the eco-system is still vulnerable to theft. Users keep keys to their Bitcoins and make transactions with the help of wallets. Exchanges facilitate trade between Bitcoins and fiat currencies, and also allow for storing Bitcoins. Bitcoins can be stolen through wallets or exchanges. Exchanges have been targeted more frequently than wallets because many wallets are located on users’ (local) computers, while exchanges frequently store customer deposits in their own (much larger) wallets. The supply of most cryptocurrencies increases at a predetermined rate, and cannot be changed by any central authority. There are about 15 million Bitcoins currently in circulation, with the ultimate number eventually reaching 21 million. The fixed supply in the long run creates concerns about the deflationary aspect of the currency. While Bitcoin shows great promise to disrupt existing payment systems through innovations in its technical design, the Bitcoin ecosystem1 has been the frequent target of attacks by financially motivated criminals. Due to the unregulated, decentralised environment in which they operate, cryptocurrencies are under constant threat of attack. Bitcoin only recently became a subject of research in economics. However, the topic has been of interest for longer in computer science (for early work by computer scientists on incentives, see Babaioff et al. 2012, and Eyal and Sirer 2014.) Numerous researchers have conducted studies in order to document and combat threats such as Ponzi schemes, money laundering, mining botnets, and the theft of cryptocurrency wallets (Moeser et al. 2013, Vasek and Moore 2015, Vasek et al. 2016, Yuxing et al. 2014). Ron and Shamir (2013) attempt to identify suspicious trading activity by building a graph of Bitcoin transactions found in the public ledger. None of these papers can associate individual transactions with specific users of the currency exchanges. In recent work, we show that the first time Bitcoin reached an exchange rate of more than $1,000, the meteoric rise was driven by fraud (Gandal et al. 2017). We leverage a unique and very detailed dataset to examine suspicious trading activity that occurred over a ten-month period in 2013 on Mt. Gox, the leading Bitcoin currency exchange at the time. We first quantify the extent of the suspicious/fraudulent trading activity and show that it constitutes a large fraction of trading on the days the activity occurred. We then show how this trading activity affected the exchange rates at Mt. Gox and other leading currency exchanges. While it was the dominant currency exchange when Bitcoin first shot to prominence in early 2013, behind the scenes, Tokyo-based Mt. Gox was in trouble. In addition to suffering from repeated denial-of-service attacks and Bitcoin thefts, two unauthorised traders were able to transact on the exchange without spending real money. In the first case, a trader dubbed ‘Markus’ was credited with Bitcoins by duplicating previously completed transactions. In the second case, a trader dubbed ‘Willy’ bought Bitcoins from traders by ‘crediting’ the sellers’ accounts with fiat currencies that, in many cases, could not be withdrawn. Figure 1 shows when these fraudulent traders were active, along with the Bitcoin–US dollar exchange rate. Most noteworthy is that Willy’s operation coincided with an unprecedented jump in the price of Bitcoin: from around $150 to over $1000. In early 2014, Mt. Gox collapsed, and the Bitcoin price fell with it. Only recently, in early 2017, has Bitcoin surpassed the levels of the earlier rise. In our full paper, we conduct a regression analysis to examine whether other factors such as the relatively numerous and varied attacks on the Mt. Gox exchange could explain the change in the daily Bitcoin price, both at Mt. Gox and other leading exchanges (Gandal et al. 2017). The analysis confirms that only Willy’s trading presence affected the price. The estimated coefficient (on the dummy variable for whether Willy was active) is virtually the same ($21.65) as in Table 1. 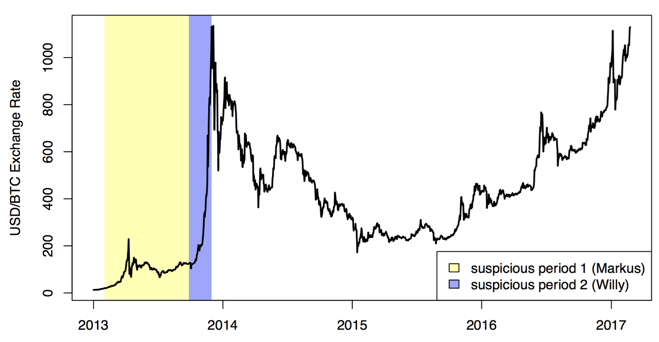 We conclude that the suspicious trading activity of a single actor was the primary cause of the massive spike in the Bitcoin–US dollar exchange rate, in which the rate rose from around $150 to over $1,000 in just two months in late 2013. The fall was nearly as precipitous: the Mt. Gox exchange folded due to insolvency in early 2014, and it has taken more than three years for Bitcoin to match the rise triggered by fraudulent transactions. Why should we care about the Bitcoin manipulation that took place in 2013? After all, the Bitcoin ecosystem is not nearly as important as the New York Stock Exchange. Nonetheless, recent trends indicate that Bitcoin is becoming an important asset in the financial system. Trading in cryptocurrency assets has exploded recently. In the case of Bitcoin, during the one year period ending in mid-June 2017, the market capitalisation increased massively from around $7 billion to $45 billion; that is an increase of over 500% in one year. The market cap of other cryptocurrencies surged by even more. In the one-year period ending in mid-May 2017, the market value of cryptocurrencies excluding Bitcoin surged from $1.7 billion to more than $29 billion; that is an increase of more than 1,900%. The markets for these other cryptocurrencies are very thin and subject to manipulation. Given that we now know the Bitcoin price has been artificially inflated by unauthorised trades in the past, we must view the present rise with great caution, and not necessarily consider it a ‘healthy bubble’, as recently claimed in The Economist (2017). As mainstream finance invests in cryptocurrency assets and as countries take steps toward legalising Bitcoin as a payment system (as Japan did in April 2017), it is important to understand how susceptible cryptocurrency markets are to manipulation. We encourage the nascent cryptocurrency industry to work with regulators and researchers to share anonymised transaction data so that more confidence can be placed in the veracity of exchange rates. •The Economist (2017), “What if the bitcoin bubble bursts?”, 3 June. •Babaioff, M, S Dobzinski, S Oren and A Zohar (2012), “On bitcoin and red balloons” in Proceedings of the 13th ACM Conference on Electronic Commerce, pp. 56-73. •Eyal, I and E Sirer (2014), “Majority is not Enough: Bitcoin Mining is Vulnerable”, paper presented at the Eighteenth International Conference on Financial Cryptography and Data Security, Barbados, 3-7 March. •Gandal, N, J Hamrick, T Moore and T Oberman (2017), “Price Manipulation in the Bitcoin Ecosystem,” CEPR Discussion Paper No. 12061. •Mooser, M, R Bohme and D Breuker (2013), “An inquiry into money laundering tools in the Bitcoin ecosystem”, in Proceedings of the Seventh APWG eCrime Re-searcher’s Summit, pp. 1-14. •Ron, D and A Shamir (2013), “Quantitative analysis of the full Bitcoin transaction graph”, in Financial Cryptography and Data Security, Vol. 7859 of Lecture Notes in Computer Science, pp. 6-24. •Vasek, M and T Moore (2015), “There’s no free lunch, even using Bitcoin: Tracking the popularity and profits of virtual currency scams”, in R Bohme and T Okamoto (eds), Financial Cryptography and Data Security, volume 8975 of Lecture Notes in Computer Science, pp. 44-61. •Vasek, M, J Bonneau, R Castellucci, C Keith and T Moore (2016), “The Bitcoin brain drain: a short paper on the use and abuse of bitcoin brain wallets”, in Financial Cryptography and Data Security, Lecture Notes in Computer Science. •Yuxing Huang, D, H Dharmdasani, S Meiklejohn, V Dave, C Grier, D McCoy, S Savage, N Weaver, A Snoeren and K Levchenko (2014), “Botcoin: Monetizing stolen cycles”, in Proceedings of the Network and Distributed System Security Symposium. The Bitcoin ecosystem includes the core network for propagating transactions, the blockchain, and many intermediaries such as currency exchanges, mining pools, and payment processors that facilitate trade. Markus was primarily active in period 3, but he was also active a few days during periods 1,2, and 4. He was not active on the same days as Willy, who was only active in period 4.